You must configure the proxy servers for Connect Filter to proxy through. Typically, this is your Smoothwall. 1. From your Smoothwall, go to Web proxy > Mobileproxy > Proxies. • Server name — The name to identify the proxy server. • Server address — The IP address or hostname of the proxy server. Typically, this is the external IP address of your Smoothwall. You can also use the IP address that forwards through to your Smoothwall instead. • Comment — You can choose to enter optional text about the proxy server. 4. Repeat steps 2 and 3 to add additional proxy servers. Note: Any additional proxy servers added here, must have the server key of the original proxy server installed. For a detailed description of how to do this, see Generating Server Keys. All configured proxy servers appear in the MobileProxy servers panel. The order they are listed determines the order of priority, from top to bottom. Connect Filter will try each proxy server until an available proxy responds to requests. You can change the priority order by dragging and dropping the servers in the MobileProxy servers panel into the required order. 2. Click the button for the configured MobileProxy server. 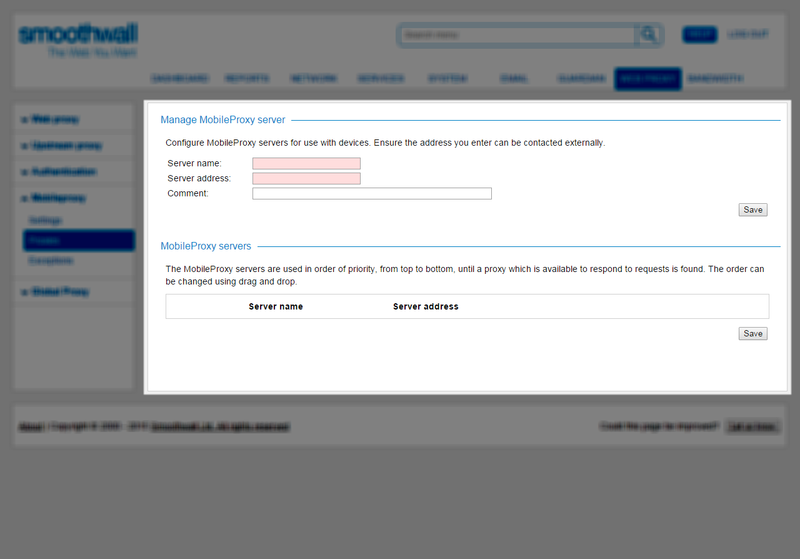 The configured parameters will appear in the Manage MobileProxy server panel. Change the parameters as required, and click Save. 3. Confirm the correct MobileProxy server, and click Delete.